Board certified in hematology and medical oncology, Dr. Hirth is a graduate of Thomas Jefferson University Medical School in Philadelphia. She fulfilled her residency in internal medicine at the Graduate Hospital Philadelphia and completed a fellowship at the University of Michigan, before joining the medical staff of Henry Ford Allegiance Health in 1997. 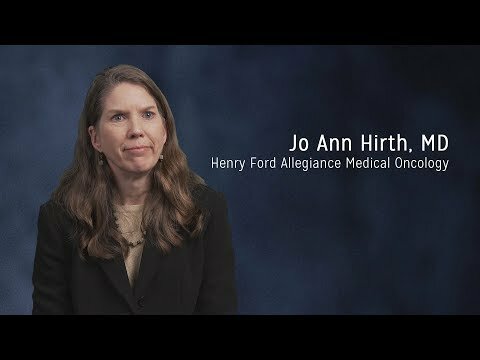 Seen as an expert in her field, Dr. Hirth participated in enhanced training and research in chemotherapy and has presented to her professional community. Dr. Hirth is currently serving a two year term as President of the Michigan Society of Hematology Oncology and is a committee member of the American Society of Clinical Oncology. Dr. Hirth is known as a calming presence in stressful situations. Patients appreciate her professionalism, her attentiveness and her willingness to listen.